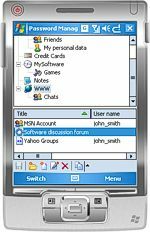 Password Manager XP Mobile currently available for Windows Mobile based Pocket PCs (Pocket PC 2003/SE, WM5, WM6, WM6.1). Windows Mobile based smartphones are not supported yet. You get full strength of desktop based Password Manager XP on your mobile device. Password Manager XP Mobile supports the same database format and same key features as desktop version. database and folder fields can be fully customized. It is possible to add/modify/remove fields for individual folder or entire database. Uninstall instructions: When any setup package below is installed on your mobile device, it can be easily removed using the standard Windows Mobile mechanism to uninstall applications. All changes to your Windows Mobile system made by the package will be reverted during the uninstall.